Irfan Ali’s death impacted countless lives and gave a face to the tragedy. QUETTA: After a wait of four days, Irfan Ali, 33, has reached his final resting place after leading a life of struggle and triumph – the struggle of a community member wronged; the triumph of a courageous heart that served selflessly despite threats. Irfan was buried on January 14 along with more than a 100 members of the Shia Hazara community who lost their lives in a series of bomb blasts on January 10 in Quetta. Though the dead were mostly unknown to most apart from their friends and family, Irfan Ali’s death impacted countless lives and gave a face to the tragedy. A human rights and peace activist from the Hazara community, Irfan’s zeal was infectious. He was able to inspire every colleague and acquaintance with effortless ease. The brave man’s only aim was to salvage innocent lives from the clutches of tyranny and injustice. The irony of his death in the Quetta blasts can therefore not be emphasised enough. It was after the first blast that he, along with several other young men of the Hazara community, fled to the carnage site to rescue people – only to add to the number of casualties as another blast rocked the area. Irfan died saving lives, literally. In losing him, it wasn’t just the fraternity of peace activists that lost a salient member: his young wife lost a husband, his parents lost a son, his younger brother, who is battling injuries received at the blast, lost a brother. An entire family is grieving, as is a community, as is a nation. His Twitter followers mostly knew him as Khudi Ali. Iqbal’s philosophy of Khudi resonated with the young man – he wanted the self to rise above the pettiness and ego that results in human violence, which explains why he added the word “Khudi” as a middle name. In compliance with strong implications of his middle name, Irfan’s work was not Hazara-specific. The man fought for peace and justice for all communities. With this in mind, he formed, in early 2011, the ‘Human Rights Commission for Social Justice and Peace’. With this he wanted to increase awareness about human rights violations, the causes and solutions. Journalist Shiraz Hassan, who had worked with Khudi Ali, is still in denial. “This is heart-wrenching. I cannot forget the smiling face of Irfan Ali. He gave a voice to his voiceless community and his words are still echoing in this gloomy atmosphere and asking the government and security agencies to protect its citizens.” To Hassan, Irfan’s tweets “continue to haunt us”. Irfan had tweeted shortly before his death, some of the last words he left behind. The words were, of course, about the struggle of the Hazara community. Huma Fouladi, a human rights activist from the Hazara community, lost a fellow comrade and friend when she lost Irfan, and is still grieving. “I have lost my strongest ally. He was like my family,” said Fauladi, hours after Irfan was finally laid to rest. Posted in Human Rights, Straight From The Heart and tagged Hazara community, Irfan Ali, Irfan Khudi Ali, Quetta, Quetta bomb blasts, Shia Genocide, Shia Hazaras. Bookmark the permalink. QUETTA: The Hazara community has announced that it will wait for the notification of governor’s rule in Balochistan on Monday before ending their nationwide sit-ins. Before the late-night development, the entire Shia Hazara community in Quetta was out in the merciless sub-zero temperatures of winter, away from the comfort of their homes, for the fourth straight day. Thousands of people from all walks of life, ethnicity and religious background were also continuing their sit-ins elsewhere in the country to press for their demands. Till this story went into print, the number of dead bodies the Hazaras had been refusing to bury as part of a peaceful but powerful protest is 114, with more being added every day as the injured of the blasts continue to succumb to their injuries. Sources in the Hazara community claim the injured are not being given the medical care and attention they deserve. A visual scan of the crowd at the protest revealed both men and women, of all age groups. Grandmothers were protesting alongside newborn babies as young as 10 days old, out in the cold. “We have not gone home even once in these four days. We are not willing to leave our dead all alone. They are not being buried for a reason. They are waking up the numb conscience of many, something even alive Hazaras have not been able to,” said an unnamed female Hazara activist at the occasion before the late-night clamping of governor’s rule in Balochistan. According to the Human Rights Commission for Social Justice & Peace, in Pakistan there are an estimated 956,000 people belonging to this community, of which 600,000 live in Quetta city alone. “Mainstream media has not given this protest the coverage it deserved. It was only after we had incessantly tweeted and created at least 250 Facebook pages, that people became aware of our plight as we sat waiting alongside our martyrs,” said another Hazara activist. 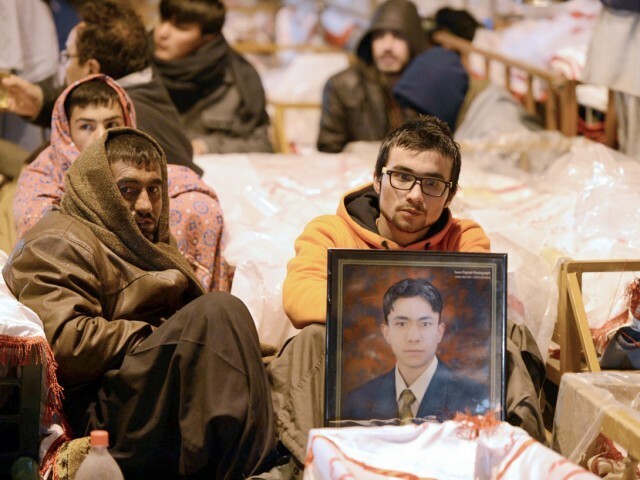 The haunting photographs of grieving Hazaras sitting alongside an array of coffins with eyes searching for justice became viral on social media and finally woke up the media in general. “Everybody is saying we should bury our dead because Islamic tradition demands the dead be buried at the earliest. We are Muslims. We know that. But people have to understand that this is an exceptional situation. “Political forces are pressurising us to give up on our demands and keep saying ‘bury the dead and then we’ll talk’. But we know that once the dead are buried, there will be no pressure. More Hazaras will continue to be slaughtered. It’s better to go through this pain today than having to bury our loved ones month after month,” said the female Hazara activist on Sunday evening. According to her, they have had to change the shrouds of the martyrs frequently as the bleeding from the bodies continued, and it was not easy, but even in their death, the dead were helping potentially towards saving lives. A wave of support in the last 4 days has highlighted the plight of the Hazaras. Hazara activists expressed satisfaction and gratitude over the support the common people have shown. “We thank you for standing up for our community. Rest assured, if tomorrow something happens to your communities, God Forbids, the Hazaras will stand up for what is right,” said a Hazara community elder. Interestingly, the most support from members of other ethnicities in the Quetta area has been from women. “It’s heartening to see Punjabi and Urdu-speaking women, besides other ethnicities too, slowly trickling in and joining us to support us, even though they know that it’s not the most secure place,” said a grateful Hazara woman. Published in The Express Tribune, January 14th, 2013. Posted in Human Rights and tagged Express Tribune, Hazara community, Quetta, Quetta bomb blasts, Shia Genocide, Shia Hazaras. Bookmark the permalink. It is an almost wintry morning in Karachi. There is a nip in the air. Lazily, she switches off the fan. Karachi’s weather is also like Karachi itself – interesting but confusing. Outdoors, it is sunny and warm bordering on hot. A trickle of sweat down one’s back reminds one that this is what Karachi winters are like. Indoors she needs a shawl in which she wraps herself up tightly. Maybe it makes her feel protected, much like a newborn, who is wrapped tightly in a sheet of cloth, to reassure it that it is safe as it was in it’s mother’s womb. We all have our fake reassuring sheets of cloth….our cocoons….which we keep re-visiting. Her husband who is snoring blissfully, looks innocent- not at all like the man who the night before had yelled at her for their son’s abysmal grades in school. She observes him for a while. His hair is more salt than pepper now. The crow’s feet are pronounced even when he does not smile. She looks at his hands; she always liked the hands…strong, with long-fingers and a broad palm. It has been weeks since she really looked at him. The idea of a tea pot is distant now, although the piercing ray of sunlight coming through the window nudges her to wake up. “Why don’t I close the curtains properly at night?” she inwardly curses herself. Pulling up the light feathery quilt she got from the visit to Jaipur, India, over her eyes, she lazes. The house next door is under renovation. Labourers have arrived. She cannot understand why they would be there on a Sunday morning. As a Pakistani bourgeois, she mostly cannot relate to their misery. It is tough for her to empathise with someone who will wait for three hours in a CNG line to get gas for his rickshaw or a labourer who has arrived for a daily wage on a site on a splendid Sunday morning. But then, the labourer cannot relate to her voids or her problems either. I guess it’s a fair deal. She is a mother of three. 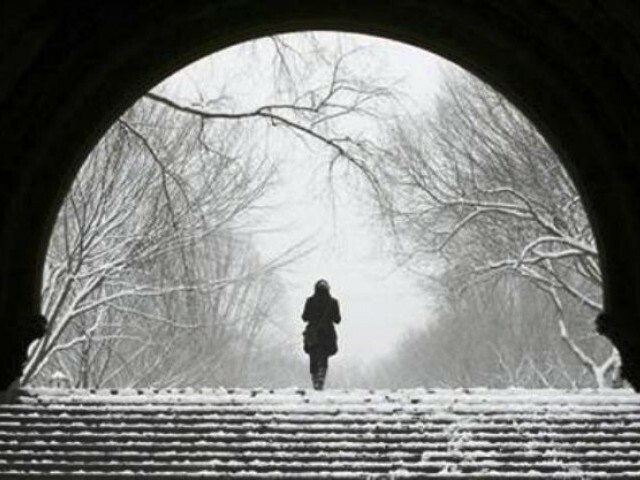 She has a comfortable life, but loneliness is a reality she cannot avoid. So, she fills that void by frequenting sales at Zamzama and trying out new dishes and poring over changes in her face and her 37-year-old body and reading socialite pages of magazines. Life did not start this way. She had dreams, once upon a time. She had once wanted a career as a physio-therapist; of a functional marriage; of children that needed her. Those dreams were now long gone. In the background, one of the labourers had put on the FM radio on his mobile phone and connected it to one of those cheap Chinese speakers for the benefit of the team. Carrying back-breaking bricks after a customary breakfast of sugar-laden tea and a fried paratha, devoid of the concept of “keep health food groups in mind: Have protein and vitamins”, the FM radio encouraged the labourers to work. Without any fans and the air-conditioners switched on, the background music was clear. On the radio the song “Dil dhoondta hai phir wohi fursat ke raat din, baithay rahein tasawwur e jaanan kiye huey” (The heart once again yearns for those leisurely times, when we could sit back, and let our imagination wander to the beloved) plays. Gulzar’s words shake up something inside her. She is transported to one of her favourite places in the world – Central Park, New York. She remembers the first time she excitedly went there with her husband, introducing Central Park to him as though she were introducing her inner self to him. His laughter and mocking words “You’re such a tree-hugger!” echoed in her ears. She knew then- there were certain parts of her that he would never understand. Deep inside she knew that she should be satisfied and even excited about their visits to Saks Fifth Avenue, or the less fancier version Macy’s, but not Central Park. (Lying laidback in the courtyard, under the mild winter sun, Covering the face under the shade of your shirt’s lower hem, And alternately turning over or lying on the side). This dream has pinched her after many years…an unrealistic ideal. Lying in her bed in Karachi, in that moment, she is teleported to Central Park, NYC – her head in the lap of an unknown, unnamed man, who reads his own book with his back against a tree, while she reads hers. Every few pages, they look at each other and exchange a smile, or share an interesting line in the book. The Jaipur quilt is lifted off her face. He gives her a quick peck on the cheek, switches on the lights, and goes out to get the Sunday newspaper. She wakes up with a smile, strangely refreshed by that half-dream. Whilst planning breakfast in her mind she ties her hair up in a careless bun and enters the washroom to splash her face with water, till the unknown man and Central Park drown. Only then does she wonder where her husband drifts to when he is lonely. Posted in Straight From The Heart, Women. Bookmark the permalink.